Dan Absalonson | Author of SciFi & Fantasy: And Another Audiobook! 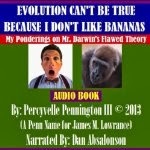 I had the pleasure to narrate another audio book by James M. Lowrance under the pen name of Percyvelle Pennington III. This one is called Evolution Can't Be True Because I Don't Like Bananas: My Ponderings on Mr. Darwin's Flawed Theory and it's much more hilarious than it is controversial or opinionated. Click the link and give it a listen. Thanks for stopping by! Cue Bull reviewed - 5 stars!